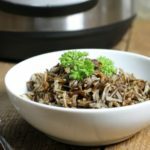 Cooking Instant Pot wild rice is incredibly easy. Just add the rice and water to the pot, set the program, and away you go! A healthy and nutritious side dish, cooked without you in the kitchen! The Instant Pot can be a true time saver in the kitchen. While I have personally found the Instant Pot to deliver similar cooking times to conventional methods once you factor in the heat-up and pressure release times, what it does do is allow an easy ‘set it and forget it’ style of cooking, where there is no need to hover over the stove or pots. Why Not Just Cook Wild Rice The Old Fashioned Way? Wild rice results cooked on the stove will vary, depending on how tight fitting a lid you use, the temperature you cook it at, etc. 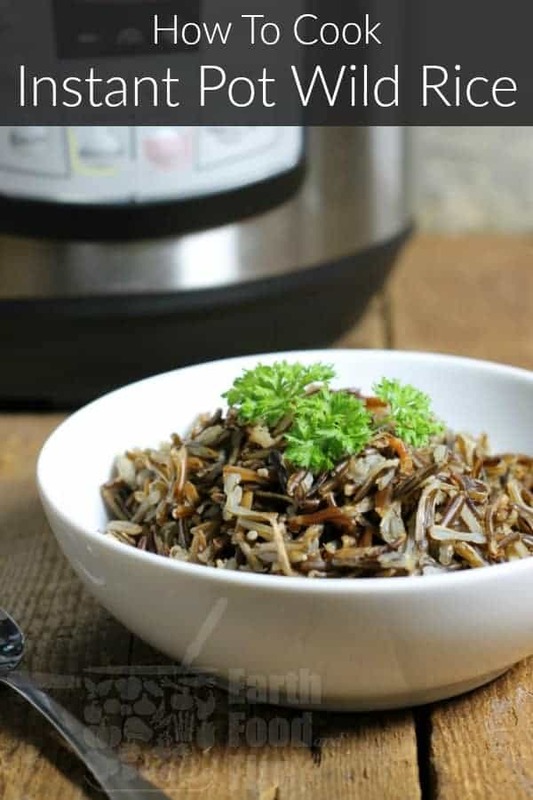 Wild rice cooked in the Instant Pot on the other hand, offers consistent results every time. The reason the Instant Pot delivers such consistent results is due to a few factors. There is no water loss through evaporation, and all the moisture you initially add to the pot along with the rice is actually used up. There is also a consistent heat source used each time, as the IP cooking program uses the same heat setting each and every time. If you cook wild rice on the stove, it can be hard to have the exact same temperature setting each and every time. This means you have to check the rice periodically to make sure there is still enough moisture in the pot. Due to the large amount of Instant Pot models available, all with different settings, you may need to refer to your user manual if the following setting doesn’t work out for you. I use the Instant Pot Lux-80. I have found the best results with cooking any type of rice in the Instant pot to be 1:1. That means if you use one cup of rice, you’ll need one cup of water. Stove top recipes will call for more water as much of it evaporates over the long cooking time wild rice needs. The IP Lux-80 which I use comes with a handy ‘Multigrain’ program which is ideal for cooking wild rice. The ‘Rice’ program cooking time is too short, and you’ll end up with hard, un-cooked grains. If your Instant Pot doesn’t have a ‘Multigrain’ program, you can also use the ‘ Manual’ or ‘Pressure Cook’, and then manually set the cooking time. The Lux series of Instant Pots all come with the ‘Multigrain’ program with the exception of the Lux Mini. The ‘Multigrain’ program has three settings. Less, Normal, and More. 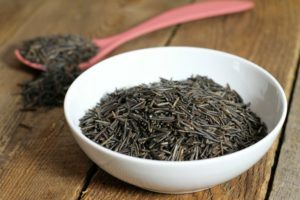 Less: Has a cooking time of 20 minutes and is ideal for wild rice, if you like the rice to have a bit of a bite and only be partially burst open. Normal: Has a cooking time of 40 minutes and can also be used for wild rice. This setting results in a softer cooked end product where all the grains are fully burst open. More: This setting includes a 45 minute warm water soaking period before cooking for 60 minutes under high pressure. This setting is less then ideal for wild rice and the end product is total mush. Note: If your Instant Pot does not have a ‘Multigrain’ function you can use the ‘Manual’ or ‘Pressure Cooking’ setting to manually select 28, 30, or 32 minutes of cooking on ‘normal’ pressure, depending on how ‘done’ you like your wild rice. 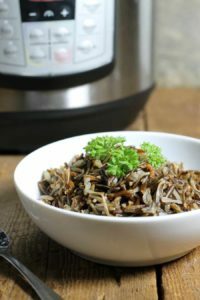 Combine the 1 cup of wild rice and 1 cup of water in the Instant Pot. Select the Multigrain program, and adjust the program to "less" or "normal". See above blog post for the difference in cooking times. Place the lid on the Instant Pot ensuring it is properly latched and the vent set to 'sealing'. Allow the Instant Pot to heat, and cook. Once the Instant pot beeps indicating the cooking program is over, allow the pressure to release with the 'natural release method' Do not release the steam manually by turning the valve to 'venting'. Serve the Instant Pot wild rice while hot, or cool it down and use in other recipes. If your Instant Pot lacks the 'Multigrain' program, you can manually set the cooking time and pressure by using the 'Manual' or 'Pressure Cooking' setting. Select 'normal' and then adjust the time to 28, 30, or 32 minutes depending on how well done you like your rice. Your info is valuable as I followed a different recipe which the rice wasn’t cooked! I had to finish it up on the stove! Glad this one worked perfectly Marlene! Wild rice is one of my favorite things to eat. Love this recipe!!! Now I know everything about cooking wild rice in instant pot! Thanks for sharing. Definitely need to include more healthy side dishes like this in my every day meal plan. This is a great side and using the instant pot really speeds up the process. Thank you for the instructions. This looks like such an easy and quick dish Markus! Yum, I love simple dishes that take hardly any time at all to prepare, cheers for sharing!